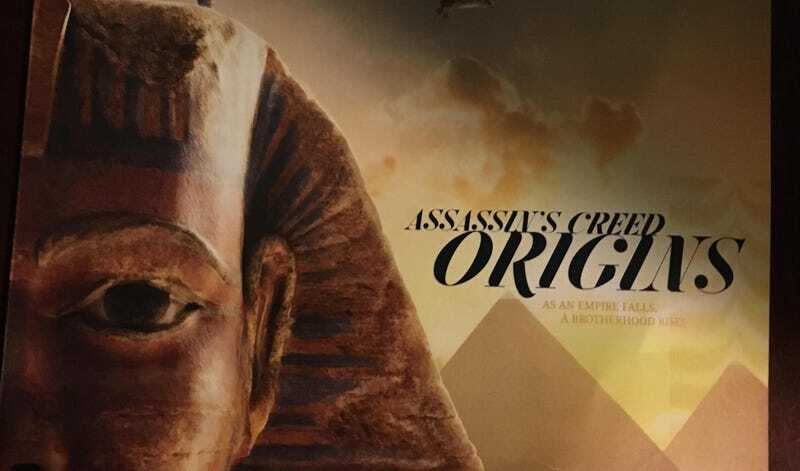 The next Assassin’s Creed is going to Egypt, and although Ubisoft hasn’t yet confirmed it, we can piece it together from roughly 2349892483294832 leaks. Today’s leak comes from someone with an early copy of Game Informer, whose next cover story is Assassin’s Creed: Origins, out this October. Rumors of the next Assassin’s Creed have been circulating since January 2016, when Kotaku broke news that Ubisoft’s tentpole series was skipping a year and that the next game, codenamed Empire, would be set in ancient Egypt. Then there were more leaks. There was that t-shirt. There was the Target pre-order card. And now the entire Game Informer cover story has leaked, because Ubisoft. We’ll see more at E3, unless there are more leaks before then.